J.J. Abrams has officially joined Twitter, and he's kicked things off by posting the very first set photo from the still untitled Star Wars: Episode IX - now officially in production. 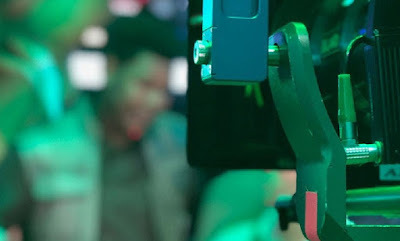 While the image really doesn't give anything away, we can see a blurry John Boyega speaking with J.J. Abrams in the Millennium Falcon's cockpit. Chewbacca can also be seen in the co-pilot’s seat in the camera’s viewfinder. Like we said, nothing major is revealed here, but perhaps this is a sign of things to come with Abrams sharing snaps from the set during production. Starring Carrie Fisher, Mark Hamill, Daisy Ridley, Adam Driver, John Boyega, Oscar Isaac, Lupita Nyong’o, Domhnall Gleeson, Kelly Marie Tran, Joonas Suotamo, and Billie Lourd, Star Wars: Episode IX hits theatres on December 20th, 2019. The film is in production now at Pinewood Studios in London, England.